The Hollywood Stock Exchange (HSX) is a web based stock trading game that trades in the success and failure of movies. The game is free to play and can provide some real insight into how a stock exchange works and what makes for a successful movie. By creating an account you receive $2 million HSX dollars to buy and sell stocks, bonds, and funds with. It is plenty of money to jump right in and create a portfolio that can take off but not so much money that you cannot lose most of it in one bad weekend. On HSX you can trade in stocks, bonds, and funds. Stocks are holdings in specific movies, bonds are holdings in credited actors, and funds are managed groups of stocks and bonds that have been brought together to create a single investment. The most powerful feature of HSX is the community forums, here you can learn about what movies are in development, who’s career is taking off, what the next big movie is going to be, and more about movies than anywhere else. I really enjoy playing the Hollywood Stock Exchange game. It keeps me informed about upcoming movies and how well the HSX community thinks they will do at the box office. My Username is Phrop, look me up and let me know what you think about the game. Posted in Website. Tagged game. 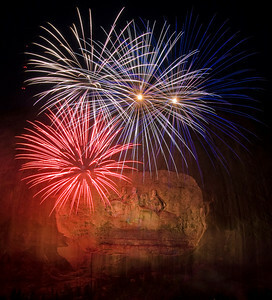 We really enjoyed ourselves at Stone Mountain Park Thursday night with the laser light show and fireworks display. I get excited about any opportunity to take pictures of fireworks and this night proved to be exceptional. I didn’t get a lot of pictures, but having the carving at Stone Mountain as a backdrop to the fireworks makes for some wonderful pictures. Posted in Photography, Pictures. Tagged fireworks, stone mountain, stone mountain park. About four years ago I found myself deep in debt to the point that I spent many nights laying awake worrying about it. I was making enough money to pay the bills that came in the mail every month, but there wasn’t a lot of money left over for having fun. I was fed up and sick of it all. I sat down with my computer and worked out a written budget, I included everything I spent money on every month, all of the bills, food, gas, rent, etc… Putting everything in a spreadsheet where I could see exactly where the money was going made it much easier for me to funnel more money to my largest bills. After two years I had made a very nice dent in the mountain of debt. Then I heard this guy on the radio telling people that they needed to have a written budget and to spend every dollar on purpose. This rang true enough with me that I started to really listen to him and tweaking the way I was working my plan. His name is Dave Ramsey and over the last couple of years his plan has helped thousands of people make a real difference in their lives, including mine. Dave’s message is now available on the radio, television, multiple best selling books, and Financial Peace University. About a year ago I married my beautiful wife; we owed money on two cars, credit cards, and a student loan. Over the past year, following what we learned by reading “The Total Money Makeover” and “Financial Peace Revisited” along with taking the “Financial Peace University Online” course, we not only paid off all those loans, but we were also able to pay cash for our wedding, buy a new camera, pay for a broken timing belt, and many other surprises that were no big deal because we had a plan. What we have learned from Dave Ramsey over the last two years has not only changed our lives but will have repercussions for our entire family tree for generations to come. We are holding FPU at St. Michaels in Brookhaven August 19th to November 11th on Tuesday nights. Contact Neal Marwitz at [email protected] for more information or to sign up.